These days identity theft is rampant. According to the Federal Trade Commission in a survey taken in 2005 over 8.3 Million adults were victims of some form of identity theft. A common method of would be thieves is to open accounts in the victims name using credit card offers stolen from their mailbox. Outright theft is also a problem, especially if you are a rural customer. Odds are your mail is just waiting at the end of the street for an opportunistic crook. For a slight bit of inconvenience you can safeguard your mail service. If you need to send a letter or package through the mail here are the best methods from most secure to least. Drop of your mail at a physical post office location during business hours. Physically hand the mail to a Postal worker. Hand the mail to your postal carrier when they are delivering your mail. Mail drop boxes inside the post office. Mail drop boxes inside any other public building. Mail drop boxes outside the post office. Inside your mailbox with the “Hey jack my mail” flag up. Protecting your inbound mail is a little trickier because your mail can sit unattended for the better part of the day depending on your schedule. For the purposes of this discussion we’ll assume that you would normally get your mail in a standard mailbox if not then you might already be well protected. So in the order of most secure to least your mail receiving options. Take out a Post Office Box and pickup your mail at the Post Office. Take a out a Mailbox at a dedicated Mail service such as the UPS store, Mailboxes Etc., The Maileporium, etc. Purchase and install a heavy duty locking mailbox. Make sure that the slot is appropriate for your normal mail volume as the USPS will not carry keys to unlock your mailbox. 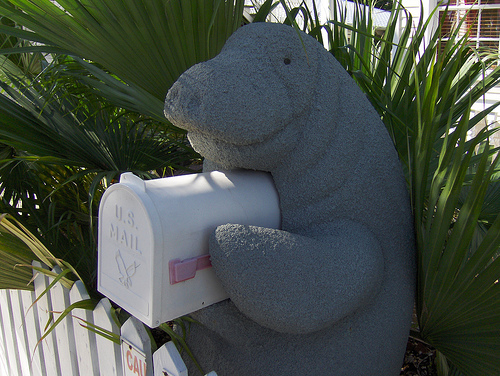 Get out your arc welder and build your own custom mailbox. Note: you need to get your custom mailbox approved by the USPS for delivery. The USPS will be more than happy to hold your mail for you, either by contacting your mail carrier, stopping by your local Post Office or online. They’ll even deliver all your mail for you once you’re back home. If you suspect that you’ve been a victim of mail fraud whatever the form you should file a report at the Postal Inspectors Site. This is also the same location you’d use if your mail has been tampered with, your mailbox was vandalized, false change of address, or virtually any other form of mail fraud. I almost always mail things from work. We have outbound mail every day anyway, and people are welcome to add their personal mail to it. We always have our mail held when we are gone, and have typically had good luck. One time, however, the mail was not delivered when we returned. We called the post office and they admitted that they had indeed goofed. My wife asked when we could expect them to deliver the mail that day, since they were supposed to deliver it. The person answering the phone said that the people in charge were in a meeting. I really didn’t expect anything t happen, assuming that they’d just deliver it the next day. But about 45 minutes later, the doorbell rang, and someone from USPS delivered the mail. .-= Kosmo @ The Casual Observer´s last blog ..Buying a home ““ nine innings method =-. We use a lot of the methods listed, and even have a post office box for some of the most important correspondence. But one other recommendation is to know your postal delivery times, and be careful to place any mail in the mailbox only very shortly before pick up. Of course it goes without saying to empty the box as soon after delivery as possible. It isn’t too far fetched that a lot of the mail theft that does happen is with people who aren’t too consistent with emptying their mailbox. That can also make it look as if you’re on vacation, or maybe that you’ve even moved, both prime targets for theft of all sorts, not just mail. .-= [email protected]´s last blog ..On The Radio =-. I prefer to befriend the mail lady, then she uses any excuse to hand-deliver the mail to the house and chat with me on the steps for a few minutes. Not to mention throw dog-biscuits out the window of her little truck for our massive hounds. We don’t seem to cross paths with the delivery person too often, due to schedules. We’re both gone during the week, and rarely home on mail time on Saturdays. I’ll share a word with them when we do, though. .-= Kosmo @ The Casual Observer´s last blog ..Sports Medley =-. .-= matt´s last blog ..Stoner stache =-. Great tips! It’s also a good idea to reduce the amount of junk mail that you get in the first place by opting out of receiving pre-approved offers from credit card companies. And make sure to invest in a quality paper shredder for any that you do receive! .-= Jim @ The Cost of Living´s last blog ..What Motivates Employees? =-. I have the post office hold my mail when I go on vacation as well. I also have been reducing the amount of mail that I receive. Instead of receiving paper statements, I receive almost all of my bills online as well as bank statements. This has reduced the amount of mail that I receive and helps prevent mail from being stolen. .-= B Simple´s last blog ..Simple Personal Financial Tips – Educational Savings =-. If anybody has had their mail held during a holiday, I’d be interested in hearing about their experience -I may change my mind and try next year. .-= ontheroadto1m´s last blog ..Getting Twitter Followers: What Works and What Doesn’t =-. I would agree it’s remarkably easy to get them to hold your mail for you, do it online with some info that most anyone could get. The full on most secure method other than not getting mail is to have it in a PO box. Every block or so, there is a post with a series of locked mail boxes and the post office loads them up. There also are two boxes at each station where small packages can be placed – so if there is a package for you, the package box key will be in your locked mailbox. We weren’t a big fan of that arrangement, but it does prevent mail theft. ThOure mail does not arrive the same time every day so you can’t time your errands around the delivery. I’m assuming it also saves time for the mail carrier to do it that way. .-= Monroe on a Budget´s last blog ..Angel Food Ministries announces Thanksgiving box =-. Just be aware that the USPS doesn’t always hold your mail! When we were away for a week they delivered it twice. I had a friends checking in anyway for the cats, so she checked and sure there was mail. I prefer to not send or receive anything important by mail. If I’m forced to, I mail it from the post office, and I watch for the mail truck if I know something is arriving soon, and head out to get as soon as I can. .-= Kelly´s last blog ..changing rooms: girls to boys/boys to girls =-. Handing mail to postal workers doesn’t do much good here in Van Nuys, CA. Most mail theft here is done by USPS employees. For instance, of 4156 First Class & Priority Mail packages we mailed in Nov 2009, 1667 were stolen by postal workers. These are bins of mail picked up by a USPS truck. We had similar problems in Sept and Oct 2009. Recently almost half of the 200 packages we mailed that day were stolen. The USPS Postmaster and Inspector General answer is “You didn’t give those packages to us”. Your points are well taken though tougher than they need to be. As a former rural mail carrier, I hated locking safety boxes. When one is delivering mail to 500 to 800 boxes it’s easy to drop the mail in the wrong box and discover it at the next box. At which point one goes back and retrieves the mis-delivered mail and corrects the mistake. ( No Harm Done ) With a locking mailbox you have to wait until the locking mailbox holder discovers the mistake and puts the mail out to be correctly delivered. And it’s easy to say don’t make mistakes with the mail but the last person that I know of that didn’t make a mistake died about 2000 years ago! Check out my blog for more I D Theft and mail theft ideas.